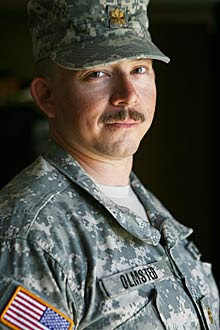 It isn't often that someone leaves a message to be posted in the case of their death, but Major Andrew Olmsted, soldier, husband, son, brother, and blogger did just that and unfortunately, heartbreakingly, the need to post his "Final Post" came to pass. Hilzoy, over at Obsidian Wings, was the person asked to do the job and she has done so, please head over there after reading his final post and leave your comments and condolences for his family and friends. So, I have my coke, Outside the Beltway has the song via Youtube up and here is to you Major Olmsted. In his last post he asks for one specific thing, that his death not be used for political purposes, so if you wish to leave a comment, feel free, but I will delete anything that does not show respect for Major Olmsted's wish in this regard. Have tissues and go read his final message to everyone.